As Bank of England has decided not to change the rates, pound grew against USD. Today GBPUSD rose and created a bullish candle but then left two bearish candles. 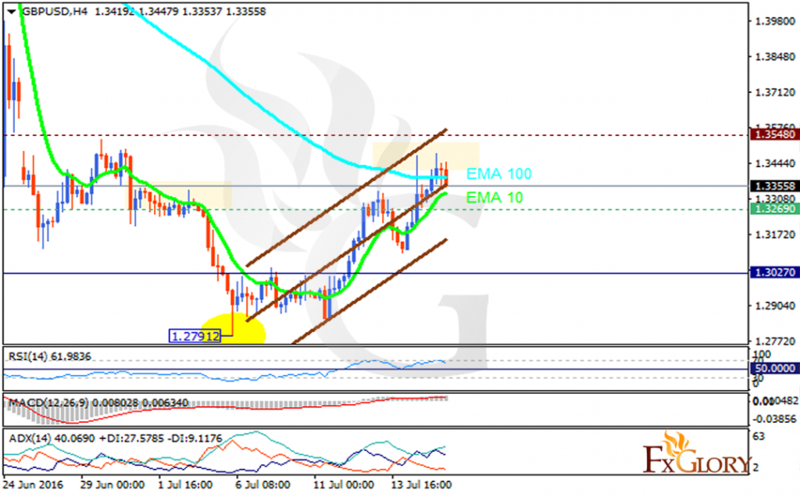 The support rests at 1.32690 with resistance at 1.35480 which both lines are above the weekly pivot point at 1.3027. The EMA of 10 is rising towards the EMA of 100 along with the ascendant channel. The RSI is moving in the overbought area, the MACD indicator is in positive territory and the ADX is showing stronger buyers than sellers. Considering the price growth it will rise to 1.3700 however if it falls it will drop to 1.2900.